Description: Corrosion preventive additive for gasoline, diesel, gasohol mixtures and alcohol fuels that also works as a fuel stabilizer and water emulsifier. Soluble in methanol blends as well as neat methanol fuel or neat gasoline. Package: 5 gallons (19 liters), 55 gallon (208 liters), totes and bulk. 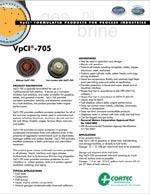 FEATURED IN: Cortec VpCI®-705 Featured in Oil and Gas Magazine! FEATURED IN: Cortec VpCI®-705 Featured in Pollution Equipment News!